I have chosen the poor to be rich in faith and heirs of My kingdom. to be rich in faith, and heirs of the Kingdom which he promised to those who love him? The gospel is good news for the poor. Jesus told us in Matthew 5 that blessed are the poor in spirit for theirs is the kingdom of God (Matthew 5:3). 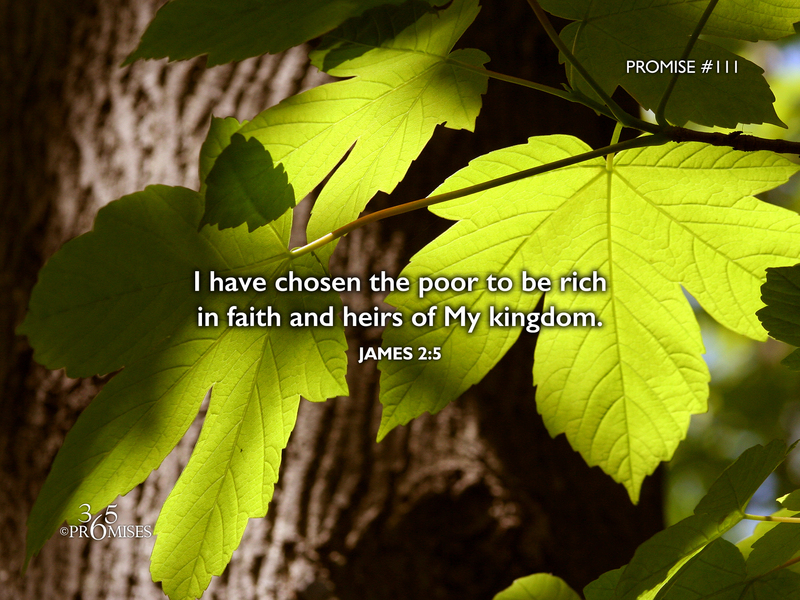 In today's Scripture, James is reminding us that God has chosen the poor of this world to be rich in faith and heirs to the glorious kingdom that He promised to all who loved Him. May this promise give strength to the weak, hope to the hopeless and encouragement to every person who feels like they are not living 'on top of the food chain' in the system of the world. God is for the underdog. He has always been for the lowly heart because He Himself is lowly in heart. The kingdom of God is a kingdom where the weak will be made strong, the poor will be made rich, and the foolish will be made wise (1 Corinthians 1:26-30). The more that we see that the gospel is about God doing for us what we could not do for ourselves, the more we will rejoice in His promise to make us rich in faith and heirs to His glorious kingdom. For me, this really is good news! ...That means I qualify!